So I made a comment and got a reply that made me realise not all had as brilliant a grandma as I did. She made sure everyone of her family had a clothespin apron. The one she made for mum is long gone, as is the first I made for myself. This is my third, and I have changed the design slightly. No measures on this sketch, you just need a big enough piece to cover your front. Mine is about 50×45 cm (18″x20″). Shoulder straps long enough to cross over. A piece of fabric for the pocket that is 10 cm (4″) wider than the main piece. I am assuming here that any who reads this knows how to sew, so this is not very detailed. Edge the angled parts of both apron and pocket. If you choose to line the whole thing, omit this step. If you line the pocket only, edge the angled parts of the apron. Make the shoulder straps and handle, attach them to the top edge, fold the top edge over to hem and edgestitch so that handle and straps point up. If lining, just attach to the edge. Sew the pocket, i.e box the lower corners, and if you’re lining it sew the pocket front and lining together at the top half: angled part, across, angled part. Attach pocket to front at the sides, and shoulder strap to the top of where the pocket meets the side of the apron. Fold over/hem all sides. (Or forget about finishing the edge if you, you know, line it). Attach the top of the pocket so that you allow some room. Say your pocket is 20 cm tall, then attach the top ca 15 cm up from bottom. Reinforcing the fabric here is a good idea. Either iron on or use a sturdy ribbon on the back of the apron – especially if the weave is a bit loose. If you’re lining this baby, now is the time to attach the lining at all sides, leaving a gap (for instance across the top). Turn it, and edgestitch all around to finish. Fill pocket with clothespins, and enjoy the ease of having the pins in a very easy to reach place. An important thing to remember is that it should not be too long, you need to be able to reach the bottom of your pocket! An earlier version I made had button fastening of the shoulder straps, so that they could be shortened for the kids. A note on fabric: I love natural fibers, so that’s what I use. And I love these wild patterns which I got as samples from a furnishing shop. It’s a curtain fabric actually, and while I would never have curtains like that (that’s a bit too much), I love it for details. But, this could also be made with mesh, in case you just want to leave your clothespins out by the line all the time. I have a hook on the wall, under the roof, so they’re not drenched every time it rains. If you make one, I’d love to see it. Would you leave a link to a photo or post in comments? Mother of two, diagnosed with MS in '94, and have been on a mission ever since. Constantly searching for the best health possible, and trying out all kinds of stuff to be able to live a good life, MS or not. My goal is to leave the MS behind, but that has yet to come (haven't given up hope, though!). 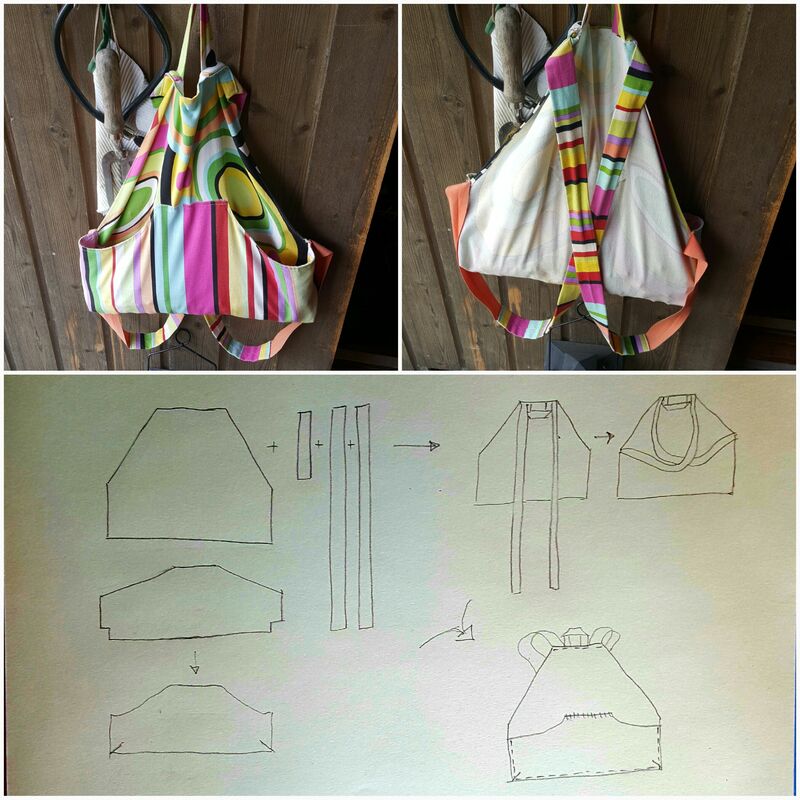 This entry was posted in craft, creativity, design, sewing, Uncategorized and tagged clothespin apron, life hacks. Bookmark the permalink. 😮 This is such a lovely idea! Love it! I made quite a few of these and called them “gathering” aprons. Teachers liked them to collect loose items in the classroom, herb gardeners loved them as well, and great beginner apron to teach to use for GS camping to carry your wash-up items. That’s a good name! Happy to hear there are more of these around, because they are brilliant. I love your design. My husband recently asked me to make him a peg apron and because my grandma hadn’t designed one I made my own version. Mine has slightly different straps. I used to be very pleased to seek out this web-site.I needed to thanks for your time for this glorious read!! I undoubtedly having fun with each little bit of it and Iâ€™ve you bookmarked to check out new stuff you weblog post.